The tavern roof is supported by a long mast – a hand carved log beam brought from somewhere far away a long time ago. 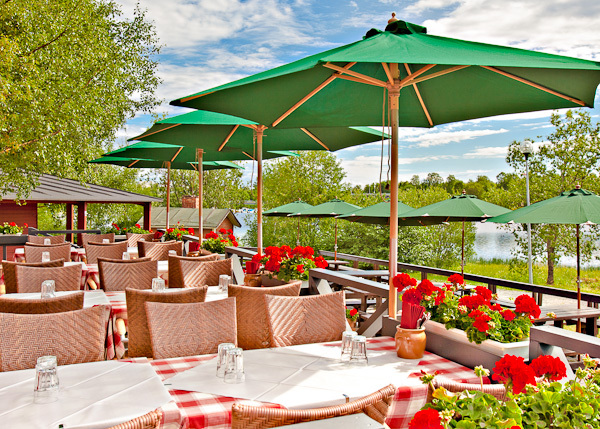 The Sokeri-Jussi Tavern is not just a restaurant among others, but an experience in itself. It is a place that stands out because of its individuality. Besides the warm feeling after a delicious meal the Tavern also stays in your memory as a cozy, calm place that serves its customers smoothly. 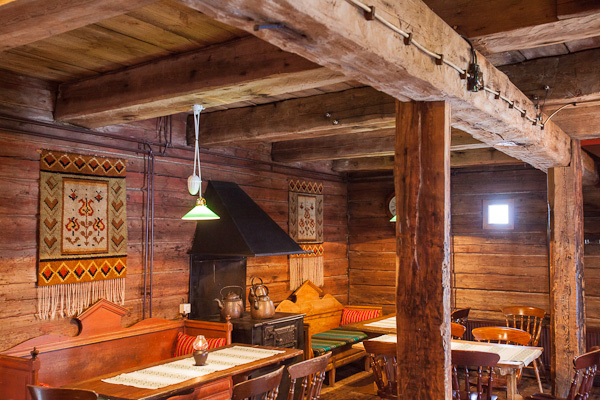 Sokeri-Jussi Tavern is located in Pikisaari in Oulu, in a hand-carved log building where shipbuilding used to prosper. Now it is the place for an authentic restaurant environment that gets its strength from respecting the past and being Finnish. In the summer geraniums – red ones, of course – bloom on the patio. What could be more fitting? The tavern storehouse has stood in its current place for 150 years at least. The exact date when the building – according to spoken lore – was floated down the Iijoki river all the way to Pikisaari is not known. Maybe it was put up during 1854 after the Englishmen had destroyed the shipbuilding industry in Oulu by burning the Pikisaari island to the ground. Pikisaari sea bank. The Tavern warehouse can be seen above the boat on the right. A detail of a postcard from 1914. The name Sokeri-Jussi (”Sugar John”) has its origins in Johan Grunström (1877 - 1953) and a steam boat he had ordered. Sokeri-Jussi was a well known ship in Oulu, even though it never sailed the seas under this name. In November 1939 Suomen Sokeri Ltd., where Grunström was the director, ordered the ship from Oulun Konepaja engineering workshop. The war delayed the building of the iron ship in Pikisaari until the autumn of 1945. The ship ended up wrecked in the bottom of the Mediterranean when it ran aground off the Algerian coast in 1969. Managing director John Grunström was one of the reformers of the Finnish-speaking business world. Among the bourgeois in Oulu he was respected as a member of the board of Oulun Konepaja. He got the nick-name Sokeri-Jussi after he fell into a 1000-litre syrup container in his factory. It would all have ended badly if a worker who had forgotten his back bag hadn’t returned and saved his boss from the trouble.